Loading accuracy as high as ±1%. Straining at variable speeds to suit a wide range of materials. Printer & PC graphs enables study the behavior of the material. Motor driven threaded column for quick effortless adjustment of test height. Simplicity in reading because of digital readouts. Large effective test space enables testing of a wide range of springs. Robust straining frame of an extremely rigid construction. Safe operation ensured by means of safety devices. Fully enclosed and protected pressure transducer. RS 232 serial port to transfer data to computer for analysis/storage & evaluation. Manual Control and release valve operation. FIE Laminated Spring Testing Machine is designed to test laminated springs and coil springs under compression and bending loads. Operation of the machine is by hydraulic transmission of load from the test specimen through pressure transducer to a separately house load indicator. The system is ideal since it replaces transmission of load through levers and knife edges, which are prone to wear and damage. Load is applied by a hydrostatically lubricated ram. Main cylinder pressure is transmitted to a pressure transducer house in the control panel. The transducer gives the signal to the electronic display unit, corresponding to the load exerted by the main ram. Simultaneously the encoder fitted on the straining unit gives the mechanical displacement to the electronic display unit. Both signals are processed by the microprocessor and load displacement on digital read outs simultaneously. It consists of a "C" type rigid frame with hydraulic cylinder at its top and an adjustable main testing table is connected to an upper cross head through two screwed columns. This main testing table along with screwed columns can be rapidly adjusted to test height by means of motor. A pair of trolleys is provided on the table to take the horizontal deflection of the spring under loading Laminated springs are tested by placing them on trolleys provided on the table. Coil springs are tested by placing them between the compression plates. The control panel consists of a power pack complete with drive motor, oil tank, Control valves and electronic display unit. The power pack generates the maximum pressure of 200 Kgf/cm2. The hydraulic pump provides continuously non putsannq oil flow. Hence the load application is very smooth. Hand operated wheels are used to control the flow to, and from the hydraulic cylinder. The regulation in the oil is infinitely variable. Incorporated in the hydraulic system is a regulating valve, which maintains a practically constant rate of table movement. Microprocessor based panel incorporating state of art technology with following feature. Front panel membrane key board with numeric keys for data entry. 7 segment display to show load and compression. Data entry of test parameters including rupture % peak, pre-load, module data, test data & specimen data etc. through numeric key board. 20 input data set storage, 50 results storage. Maintains data & results during power off. Each test facility for generating batch and statistics result. Printer port for dot metrics printer interface to print graph and results, batch certificate and simple statistics printout. The Universal 2001-UTE series control panel can be hooked to any PC using RS-232 communication port. FIE offers different exhaustive application, Window based software packages with real time graph on PC to enable the user to effectively evaluated different parameters. Real Time Graph, User friendly software. Extensive graphics on screen for curve plotting, magnification & zooming. • Software features includes Graph comparison, point tracing facility. Different units selection for load & displacement. Statistical evaluation with water fall dig., Mean deviation, frequency distribution, Skew dig., Histogram. Also calculates max. value, min. value, Mean value, Varience, Standard Deviation. (Other statistical parameters on request). Selectable batch & statistical printouts. Evaluation of wide range of user selectable parameters such as % elongation, % reduction in area, young's modulus, yeild stress, proof stress etc. Software packages for Shear, Bend, Torsion, Rubber, Textile testing etc. Custom built application software to suit customer requirements. 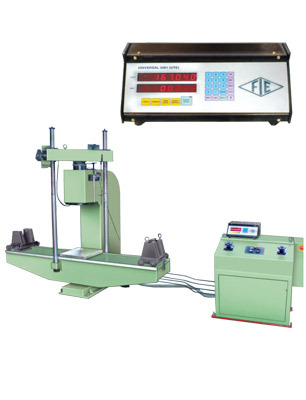 FIE Spring testing Machine complies with Grade "Aft of BS: 1610:1964 and grade 1.0 of IS 1828-1975. An accuracy of ±1 % is guaranteed from 20% of the load range selected to full load. PC and Printer is not in our standard scope of supply. It is recommended that machines be erected on a foundation. Details on foundation can be given on request. The dimensions given are all approximate. Due to constant research & development, Specifications and features are subject to change without notice. Fuel Instrument & Engineers Pvt. Ltd. Plot No. 68 to 89, Parvati Co-op. Industrial Estate Ltd., Yadrav ( Ichalkaranji ) - 416 145, Tal. Shirol, Dist. Kolhapur, Maharashtra, India.